A former television camera and lighting expert from Nottinghamshire is embracing the opportunity to reduce his risk of Type 2 diabetes by increasing the exercise he takes and being more conscious about what he eats. 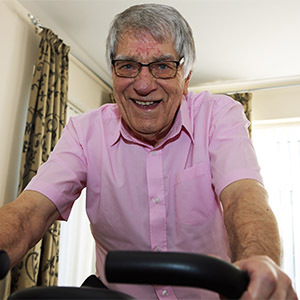 Derek Constable, who’s 80 and lives in Beeston, signed up to his local Healthier You: NHS Diabetes Prevention Programme after being told by his GP he was at risk of falling victim to the life-changing disease. Just four months in to his ten-month programme, the results have been quite dramatic. Derek has lost almost three stones in weight and he says he feels years younger as a result. “My resolution to make the change needed to stay healthy is strong,” he said. As well as enjoying the benefits of losing weight and being more active, Derek also wants to continue to care for his wife, who has both dementia and mobility issues. The Healthier You: NHS Diabetes Prevention Programme is delivered in Nottingham by Ingeus. “It can be challenging to make changes to your habits as you may have had them for many years,” said Ingeus educator Amy Gouldstone.